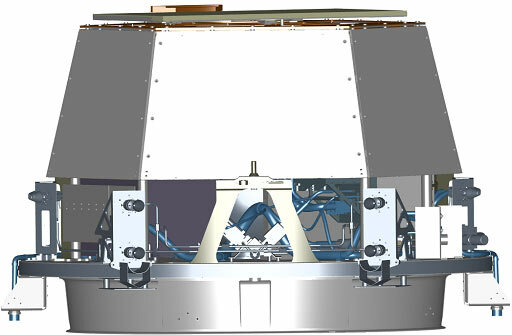 The impactor is designed to fly itself to a sunlit portion of the comet visible from the flyby spacecraft and Earth's ground-based telescopes. Once there, the comet will actually collide with the impactor at over 10 km/sec (>23,000 mph/hr). We expect a crater ranging in size from a house to a football stadium, two to seven stories deep. The impactor weighs 370 kg (about 820 lbs) and is 1 meter (3 1/2 ft.) in diameter by 0.8 meters (2 3/4 ft) tall. The forward section (bottom) is a series of honey-combed copper plates forming a dome shape that is designed to make the density of the impactor match the anticipated density of the comet, thus opening up a large crater. The back section contains the battery, electronics, computers, propulsion equipment and steering instruments that guide the spacecraft to the comet. The left picture shows the impactor ready for flight though without thermal blankets. 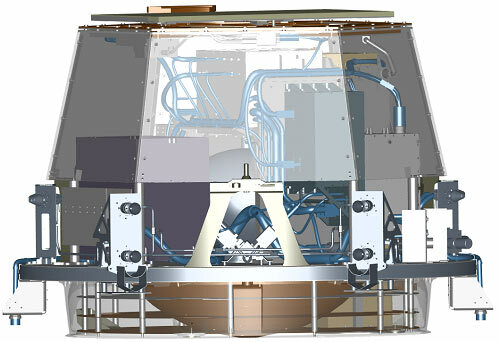 The right picture shows an "x-ray" view of the impactor with the outer walls displayed as transparent showing the internal components listed above. CREDIT: Ball Aerospace & Technologies Corp.